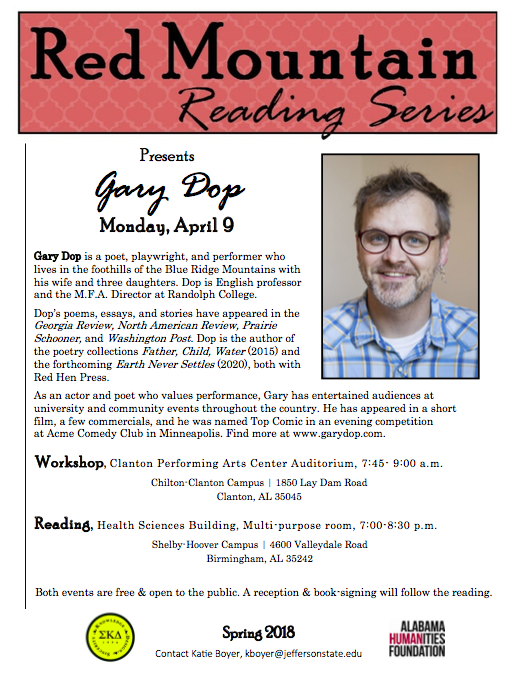 Gary Dop, a Virginia-based poet, playwright, and performer, will offer a reading at the Shelby-Hoover campus of Jefferson State Community College on Monday, April 9 at 7:00 p.m. Dop’s first poetry collection, Father, Child, Water, was a best-selling poetry title with Red Hen Press in 2015, selling out of its first print run in two months. The event is free and open to the public and will take place in the Health Sciences Building. A reception and book-signing will follow. Dop’s poetry has often been compared to that of Billy Collins, in that it is approachable and manages to find the profound hidden among the everyday. Dop’s poems, essays, and stories have appeared in the Georgia Review, North American Review, Prairie Schooner, and Washington Post. His second poetry collection, Earth Never Settles, will be published in 2020 by Red Hen Press. Dop lives in the foothills of the Blue Ridge Mountains with his wife and daughters and is an English professor and the M.F.A. director at Randolph College. As an actor and poet who values performance, Dop has entertained audiences at university and community events throughout the country. Find more at www.garydop.com. The Red Mountain Reading Series hosts three to four visiting writers per year for conversations on humanities topics in a collegiate atmosphere. The series seeks to provide students and members of the communities we serve with opportunities to interact with first-class scholars engaged in a variety of literary arts. Each year, guests address significant concerns in our culture, and the series aims to be accessible and to appeal to a broad audience. These events as part of Jefferson State’s Red Mountain Reading Series are co-sponsored by Sigma Kappa Delta English Honor Society and made possible with funding from the Alabama Humanities Foundation. For more, contact series director Katie Boyer, kboyer@jeffersonstate.edu.